THIS WEEKS THRIFTER OF THE Week! 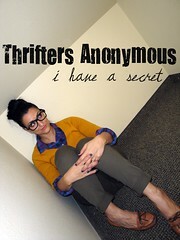 So we have 6 links on the Thrifters Anonymous Page and there are some great deals out there. While I am not quite at my goal of 100..ok not even close..I must say, I get super excited to see what people will post..so I can save some money,learn some creative ideas, or just find a way to make things better!! You must check back to see what great deals or ideas these amazing blogger's are sharing! This weeks favorite is over at My Life in a Blog . She is sharing some great bargain links for Makeup, Coupons, and More! 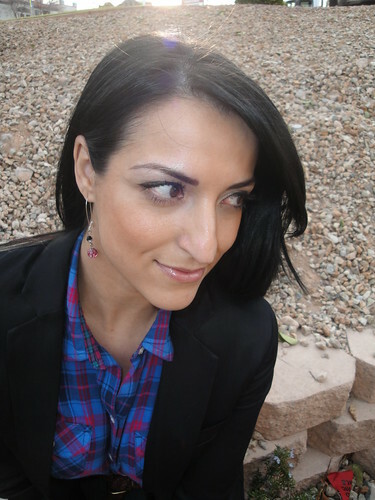 Check her link out ,let her know what you think and let her know you are coming from ColorBlind!! If you use it to buy anything please share with us and link up to Thrifters Anonymous! Have a beautiful day! Can you believe it is already March 2011? Crazy how fast time goes by! love the plaid shirt - and such a classy outfit! I need to try and branch out a little in what I combine. As for right now I am pretty excited about some t-shirts I just bought that say funny things. hi!!! Really beautifull outfit :-) so chic!!! I love the ensemble and so happy you love the earrings!!!!! You totally made it work. I'm so loving the plaid shirt with the skirt, I wish I still owned a plaid shirt (other than my pajama top.) Must add that to my list of things to hunt for.